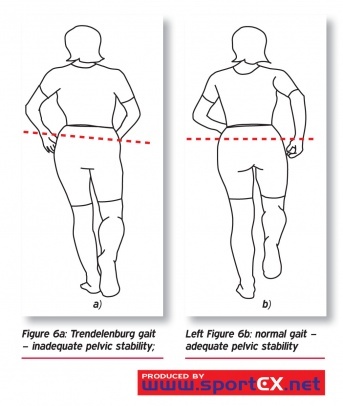 The Trendelenburg test is a quick physical examination that can assist the therapist to assess for any hip dysfunction. A positive Trendelenburg test usually indicates weakness in the hip abductor muscles: gluteus medius and gluteus minimus. These findings can be associated with various hip abnormalities such as congenital hip dislocation, rheumatic arthritis, osteoarthritis. A positive test is one in which the pelvis drops on the contralateral side during a single leg stand on the affected side. This can also be identified during gait: compensation occurs by side flexing the trunk towards the involved side during stance phase on the affected extremity. Gluteus medius and minimus are the primary abductors of the hip. When fully weight baring they act to abduct the femur away from the mid-line of the body and provide stability of the hip and pelvis. The purpose of the Trendelenburg Test is to identify weakness of the hip abductors. Beside the identification of weakness in the hip abductors of the standing leg, the Trendelenburg test can be used to assess other mechanical, neurological or spinal disorders, such as the Congenital dislocation of the hip or hip subluxation. The patient is asked to stand on one leg for 30 seconds without leaning to one side the patient can hold onto something if balance is an issue. The therapist observes the patient to see if the pelvis stays level during the single-leg stance. A positive Trendelenburg Test is indicated if during unilateral weight bearing the pelvis drops toward the unsupported side. Hip adduction during stance phase. The Trendelenburg test alone cannot diagnose hip conditions such as osteoarthritis or hip instability. It has been shown to be more effective when part of a battery of tests such as hand dynamometry and observation to help assess hip abductor strength. It is a quick, easy test that can help identify functional weakness in standing position. ↑ 1.0 1.1 1.2 1.3 1.4 1.5 1.6 Hardcastle PH, Nade SY. The significance of the Trendelenburg test. The Journal of bone and joint surgery. British volume. 1985 Nov;67(5):741-6. ↑ 2.0 2.1 2.2 2.3 Macnicol MF, Makris D. Distal transfer of the greater trochanter. The Journal of bone and joint surgery. British volume. 1991 Sep;73(5):838-41. ↑ Palastanga N, Soames R. Anatomy and Human Movement: Structure and Function. 6th ed. London, United Kingdom: Churchill Livingstone; 2012. ↑ Rang M. Anthology of orthopaedics. Edinburgh. E&S Livingstone, 1966; 139-43. ↑ 6.0 6.1 Windhager RE, Pongracz NI, Schonecker WO, Kotz RA. Chiari osteotomy for congenital dislocation and subluxation of the hip. Results after 20 to 34 years follow-up. The Journal of bone and joint surgery. British volume. 1991 Nov;73(6):890-5. ↑ 8.0 8.1 Dutton M. Orthopaedic: Examination, evaluation, and intervention. 2nd ed. New York: The McGraw-Hill Companies, Inc; 2008. ↑ 9.0 9.1 Youdas JW, Madson TJ, Hollman JH. Usefulness of the Trendelenburg test for identification of patients with hip joint osteoarthritis. Physiotherapy theory and practice. 2010 Jan 1;26(3):184-94. ↑ Odak S, Ivory J. Management of abductor mechanism deficiency following total hip replacement. The bone & joint journal. 2013 Mar;95(3):343-7. ↑ Roussel NA, Nijs J, Truijen S, Smeuninx L, Stassijns G. Low back pain: clinimetric properties of the Trendelenburg test, active straight leg raise test, and breathing pattern during active straight leg raising. Journal of manipulative and physiological therapeutics. 2007 May 1;30(4):270-8. ↑ Grimaldi A. Assessing lateral stability of the hip and pelvis. Manual therapy. 2011 Feb 1;16(1):26-32.